So the company sportsfest is in full swing again. Dubbed as Olimpiadas, team names were derived from the Greek gods, namely Athena, Ares, Apollo, Hera, Hephaestus, Hestia, Poseidon and Zeus. And as I previously twitted, I'm very happy with my team, Poseidon. Weheheheh. 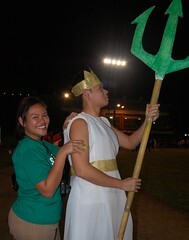 See, I'm so happy to be with Poseidon. Wehehehe. Of course, Poseidon in picture is not the reason for me to be happy with Poseidon. Labo ahahahaaha. Although, for the first time, I won't be team mates with the MVP =O So, I thought, maybe I don't have to play basketball anymore. But then, for the past two basketball seasons, our women's basketball team have always won the championship. And so I was thinking, is it just MVP bringing our teams to the championship? Or maybe it's me?!? Ahahahah!!!! Anyhoo, so I still signed up for basketball -- to get a jersey and to see if it was MVP's skills or my luck bringing us to the championship. Wehehehehe. I don't really know if I'm lucky by myself or MVP has something to do with my luck because every time MVP is in the perimeter radius (like within 5 meters), I go ahead and be, you know, sporty. I get sporty and I win pa! Can you like effing think I would play for a tug-of-war game?!? Although yes, with the weight factor and all, but I'm like, a weakling for crying out loud. Okay so that was for the opening events. How about the sport that really matters, basketball? We won our first game (against my sister's team pa)! But I didn't play because I was feeling sick then. But the MVP was in the perimeter radius because she was playing in the other half-court. Hehehehe. And their team won too! Because I was there. Ahahahaha. Although I told MVP to be in the perimeter radius lang palagi because my sporty powers are activated by her presence. Let's see what happens if I don't get to watch her play or she doesn't get to watch me play. Hmmm. Or what if our teams go against each other for the championship?!?! Ayun dun na magkakaalaman kung talagang skills ni MVP or ang swerte ko ang gumagana sa basketball. Hehehehe. Okay, so I may be lucky in sports, but I was having the worst of luck last Wednesday morning. So, I have been using a borrowed phone from D's stepdad for the past few weeks because D thought it was such a mature thing to do to throw my N91 against the wall when we had that falling out last January. The stepdad then texted me last Wednesday morning that my MIL needed the phone to use with her Sun line. [They moved-in to the house that the MIL was building for D and I, but then since I was thinking of moving out with Darice, the in-laws were the ones who moved in sa new house na.] And that I should leave the phone right then and there so that their helper can pick it up later in the morning. And I don't know why but I was filled with extreme hate and rage for D, sending him a hate message first before I took out my sim from the borrowed phone. I wouldn't be having phone problems in the first place if he didn't wreck my phone, and has the decency to at least replace it diba??! Aaaaaargh. So that's basically what I wrote in the hate message. And that I wanted to wreck his bulok phone that he only uses to text his flirt-mates and officemates. And that I hated him. Lech. But then if you saw me later in the morning, you wouldn't believe I was having the worst of luck. Okay okay, so you're thinking whaaaaaaaaaat how when why? Yes, terribly unlucky with cab drivers, traffic and lovers. But so, so, so lucky with friends. @leenoh hahaha, wag mong isipin na parang talagang rebounder ako ha. nakikisama lang ako dun sa mga players na nasa ilalim hehehe. 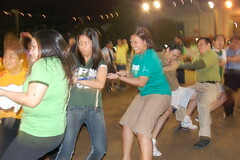 buti pa kayo at ang company nyo, marunong mag laro at mag team building. mantakin mo namang the first and only company outing/sports activity/teambuilding paintball daw? di nga ako sumama (KJ). Me bakante ba jan sa inyo? @bambit awww. hirap nga non, pano kung di lahat gusto magpaintball? email mo sakin resume mo hehe. "Yes, terribly unlucky with cab drivers, traffic and lovers. But so, so, so lucky with friends." @haze, hindi pa nga tapos elims eh. baka april pa nga championships. hehe.